Thousands of people dream about moving to San Francisco, but not all of them realize what this city holds in store for them. Most of us believe that we will see that breathtaking picture of the city how it is depicted in the series, movies or photos. But the reality can seem different when you learn all the pros and cons of living in San Francisco Bay Area from California Movers. What do we know about San Francisco? This is a large city located in the north of the state and facing the Bay. However, there are many interesting facts about it too. Covering the area of 46.89 square miles and having a population of over 850,000, it is the 2nd most-densely populated large city in the country. It has a huge metropolitan area with over 4.6 million people living there and is a hub of the San Jose-San Francisco-Oakland metropolitan area, home to over 8.7 million people. The population of the city consists of different races, but still, almost 42% are non-Hispanic white people, over 33% are Asian and over 15% are Latino or Hispanic. The Chinese constitute the largest ethnic minority group taking over 21% of the total city population. Moreover, the city is incessantly expanding and takes the 20th place among fastest-growing ones. It is the only American city where even local residents do not know the exact number of neighborhoods, while the annual increase in population is over 1%. At the same time, if previously net domestic migration – the number or in and out-migrants – was almost equal, in 2017 the number of people who wanted to leave has almost doubled. However, the percentage of foreign migration is so high that the city still gets more people than loses. Another good news is the fact that people who arrive in the city are richer, smarter, and younger according to the analysis by BuildZoom because they have shown a ‘positive income sorting’. Where do new residents of San Francisco come from? A great part of the newly arriving population is immigrants. 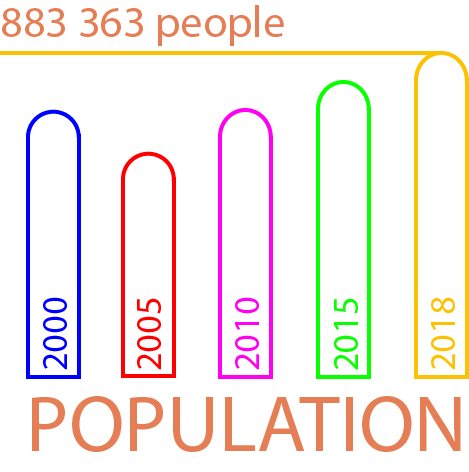 There are predominantly former residents of Latin America and Asia, but the biggest number of people come from such countries as Mexico, China, the Philippines, Vietnam, and India. However, if to analyze what American states send residents to San Francisco, the first places in the rating will be taken by Texas, New York, Washington, and Illinois. People who move within the state come from other big cities of California such as Los Angeles and San Diego. If to analyze data for what cities residents of San Francisco exchange their home, most of them move to other metro areas of California or such states as Texas, Oregon, Washington, and New York. What’s it like to live in San Francisco? Of course, a life in a big city on the Pacific coast has many benefits. In fact, the list of reasons to live in San Francisco is rather extensive. Featuring warm climate all year-round local residents do not feel a great difference between the seasons. It is mild during the year thanks to the cool currents of the Pacific Ocean, but the city is often influenced by cool winds and fog too. There is no unbearable heat and you can enjoy comfortable temperatures during the year. Moreover, there is no humidity and little annual precipitation. 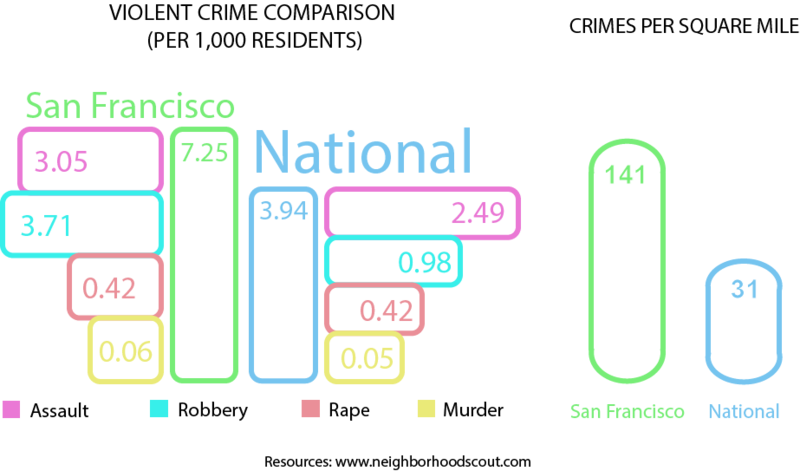 The average cost of living in San Francisco is rather high, but people who live in this city earn more too. In 2017, the county was ranked the 7th among ones with the highest per capita personal income of $119,868. Moreover, a GDP of San Francisco CSA was the third largest in the country estimated at $907 billion. 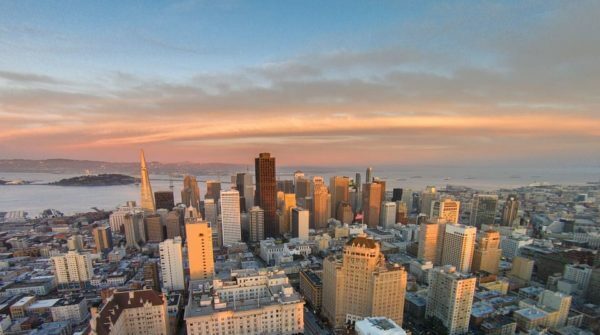 The title of a global city serves as a boost for San Francisco because the job market of the city does not stand in one place. Only for the first half of 2018, over 11,000 jobs were added and it means an annual 3% growth rate. The main directions that offer jobs are services, technology, tourism, while the biggest part of the population is employed in business services, education, government, healthcare, trade, transportation, and leisure services. The best companies to work for are Salesforce, Cooley, Kimpton Hotels & Restaurants, Workday, and Accenture. The unemployment rate in the city is rather low – about 2.1%, while the job market continues to grow too. In addition, there are many opportunities to grow professionally and get promoted or find a job with a bigger salary. Despite a rather big area of the city, it has a very high walkability score. Many people avoid spending hours in long traffic jams and prefer to walk or cycle to their destination. There are even 4 neighborhoods that have 100% walkability score and excellent access to transit. Not only climate but also the natural beauty of the region makes it perfect for different outdoor activities all year round. There is a variety of water sports including surfing, sailing, swimming, possibility to play games on the beach. People who enjoy discovering new places can go hiking, climbing, cycling in the mountains or get to another island’s trails on a ferry. If you do not want to go far away, get to the closest park to enjoy its trails and colorful playgrounds. If you have a list of “restaurants to try to”, unfortunately, it will be impossible to keep up with it. The culinary scene of San Francisco is so diverse and ever-changing that it will be impossible to taste everything even for several years. In fact, the city has about 39 restaurants per 10,000 households serving dishes from many different countries. In addition, there are numerous bakeries delivering that mouth-watering smell, so that nobody could resist a temptation to buy a bun or croissant. You will never lack that touch of beauty and classics in San Francisco because the city’s arts and culture scene is incredibly diverse. There are world-renowned museums, great collections of street art to discover, let alone galleries with glorious collections of paintings and crafts. If you enjoy classical music and dances, there are three destinations to visit – the city’s ballet, symphony, and opera. Animal lovers will not pass by the San Francisco Zoo with over 250 animal species. Though relocation to San Francisco with kids may be a real challenge, if it happens, parents will not be disappointed with the quality of education offered in the city. There are public schools run by the San Francisco Unified School District and private schools that are incredibly popular with children – over 30% of pupils attend them. The high school graduation rate in 2017 was 87.9%. The city also offers great opportunities for higher education. It is home to the campus of University of California, San Francisco State University, University of San Francisco, Academy of Art University and several others. If you live in San Francisco, there is no need to ask for advice on where to go to see the city beauty. It is enough to look out of the window and enjoy the spectacular scenery opened there. The city has a hilly topography, so the higher you go, the more diverse landscape you can see. Who can resist gazing at the endless ocean line, islands surrounded by water, magnificent bridges spreading across the Bay and mountainous areas facing you from the top? It is impossible to feel bored in the city where festivals and fairs happen more often than once a week. Every person will find an event to his taste because festivals are based on different interests including art and crafts, beer, films, food, music, wine etc. There are regular street fairs and farmer markets taking place in the city too. If the smell of cocoa beans is something that drives you mad, San Francisco will not leave you disappointed. There are many small coffee shops as well as bean-to-bar makers who will impress you with the unforgettable taste of the local chocolate and the way it is presented to the customers. It is enough to remember a chocolatier Ghirardelli who opened his workshop in the distant 1852 and it still serves local sweet-lovers. The city is home not only to many shops and bars, it is a place where sports fans can cry for several professional teams. The city has been ranked number 1 in the study that was analyzing which metropolitan areas of the US has provided the biggest number of Major Leaguers since 1920. Now, there are professional leagues in baseball, football, basketball. The city is also known for its annual Marathon, Escape from Alcatraz triathlon, and many modern facilities to go in for sports. People who want to move to San Francisco should be prepared to see many different ethnicities walking along its streets. In addition to white and African Americans, you will be surrounded by Asian, Hispanic population and many mixed races. In addition, the number of religious groups is at her extensive too: there are Christians, Jews, Buddhists, Hindus, Muslims as well as people with no religion at all. If you travel to San Francisco by car or bus, the only free way to take you there is Interstate 80 beginning at the Bay Bridge. But you can get to the city by a plane landing at San Francisco International Airport. The public transportation system is also very popular and used by 32% of the citizens. It is represented by the combined light rail and subway systems as well as large bus and trolley coach networks. There are also famous old cable cars and ferries too. Naturally, this Bay Area city is famous for its expensive price of living. How to afford living in San Francisco? According to the survey of urban living expenses, it was counted that an individual need to earn $110,357 to feel comfortable in this city. In fact, the median household income in this city is only $117,400. This six-figure sum of money is considered to be a low income because the prices for transportation (about $20 each day), healthcare (the average doctor visit is $251), gasoline ($3.37 per gallon), parking, restaurants are very high. There is also an average $492,000 income gap between the rich and middle-class population. It is impossible to say exactly what salary needed to live in San Francisco, but it should be very high if you want to buy a home there. The median home value differs depending on the neighborhood you choose, but the average Zillow listing price is $1,365,900. The cost of a square meter to buy an apartment in the city ranges from $9,616 to $12,520. Rental prices are not less disappointing. An apartment with one bedroom will cost you $3,362 in the city center and $2,732 outside it. The average rent of the 3-bedroom flat is $5,746 and $4,343 respectively. Unfortunately, living in this beautiful city with breathtaking views is not safe. There are neighborhoods that are much safer, but they are more expensive too. In fact, the violent crime rate is 87% higher than the national one and 59% higher than the California average. The property crime rate is even more disappointing: being 161% higher than the national average and 147% higher than the California average. The city has the 3rd worst traffic in the country, while the average commute time is 32 minutes. San Francisco weather can be hardly predicted because the sun can be instantly replaced by fog or wind. The difference between cold ocean current and hot air leads to the creation of fog that most often appears between 2.30 and 3.00 p.m.
With the constantly growing population, the housing stock has been decreasing for several previous years. In 2017, the decline was about 600 homes. If to compare previous years, the decrease in net addition was 12% in 2016 and 14% in 2015. Are you ready for a free workout on a daily basis? San Francisco features over 50 hills in its topography, so wear comfortable shoes leaving your home and be ready to sweat returning home from work or vice versa. The homeless crisis of the city seems impossible to solve because there are thousands of hobos living there. They are a reason for high crime rate and make tourists think twice before planning a trip to this metro. It’s a pity for big families, but experts do not recommend moving to SF with kids. Even now, the city has a smaller percentage of children than other metropolitan areas, while the median age of the city residents is 38.5. In addition, parents may have troubles with bringing children to schools, because local Unified School District sends students to schools that can be located not even in the neighborhood they live in. Another bad news for people who plan to relocate to San Francisco is the air quality. Fog and smog, as well as an often-increased number of particles, make it unbearable for sensitive people, so check your lungs before moving. Solo trips or living alone can seem dull but not in San Francisco. Even if you arrive in this city alone, you will have many opportunities to explore its beauties and get acquainted with locals if you prefer the following activities. San Francisco is a bike-friendly city where it is not difficult to rent this two-wheel vehicle. It is a perfect means to discover interesting places of the city including great murals along the Clarion Alley or the Fisherman’s Wharf with several great museums. Who has not heard of Alcatraz? This former high-security prison is a popular attraction the leaves an abundance of recollections, while a ferry trip there may result in new acquaintances. San Francisco City Guides offer regular walking tours around certain neighborhoods. You will learn more about the city and get more sociable. Beautiful nature, a luxurious view of the downtown, and nice company are offered to everyone who decides to have a picnic in Mission Dolores Park. If you want to see everything included in the must-see list, it is enough to head for a busy and loud Union Square. It will not leave you indifferent with a variety of things to do and see. As it was mentioned above San Francisco is not the best place to raise kids. Naturally, there is high-quality education, many places to go with children to, more opportunities, but at the same time, you will have to pay thousands of dollars for housing to live in the safest places or subject your kid to danger on a daily basis. A rather high crime rate and lack of places in the public schools will make your child cover a big distance each day to get to and from school. Moreover, kids will have to use public transport or get bored in the traffic jams if you decide to give them a lift. Consequently, parents should be prepared that it may be torture for them and their kids to live in San Francisco. It is natural that life differs depending on the neighborhood you choose for a living. Two main factors that influence the choice of the area for living turn out to be safety and the cost of housing. Most often, these are the most expensive neighborhoods that offer a higher quality of life, while districts with cheaper homes are located farther from the center and feature more crimes. The average home value is $981,200, while the average rent list price is $4,098. The average home value is $790,000, while the average rent list price is $3,748. The average home value is $994,800, while the average rent list price is $3,879. The average home value is $924,400, while the average rent list price is $3,883. The average home value is $873,600, while the average rent list price is $3,827. 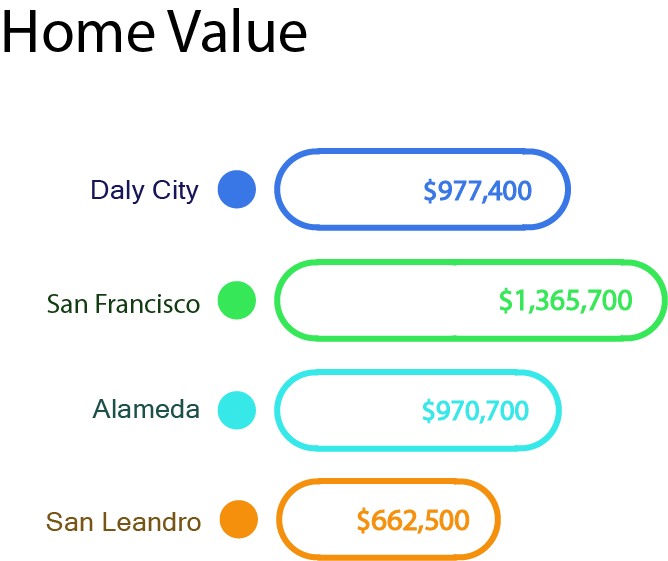 How much money do you need to live in the Bay Area city? As it was mentioned in the survey of urban living expenses, to live comfortably in San Francisco every family member should earn $110,357. However, if to analyze basic requirements to normal living, in addition to the cost of rent, a resident of the city should pay about $100 for utilities, $600 for food bills, $100-$150 for transportation etc. If you are a student who shares an apartment with 3 more people, it will be enough to have an income of $1,500 to live during a month. If you are a professional who is moving to San Francisco after college and rents a small apartment and meets only basic expenses, it would be enough to earn about $5,000. According to the Economic Policy Institute, a family of 2 adults and 2 children should earn at least $148,440 annually, which is $12,370 every month. The biggest percentage of expenses from this sum is housing cost and taxes ($3,121 and $2,593 respectively). One of the main attractions that make people move to metro areas is a possibility to live next to well-known people. In fact, there are many celebrities that live in San Francisco, so each person can not only see them walking by or sitting at the next table in the restaurant but also settle not far away from them. Members of Metallica band Lars Ulrich and James Hetfield, guitarist Carlos Santana, a vocalist of the group Huey Lewis and the News, member of the punk rock band Green Day, Canadian singer Neil Young etc. Robin Williams, Kamal Bell, Tom Hanks, Robert Redford, Sean Penn, Clint Eastwood, Danny Glover etc. Dave Eggers, Danielle Steele, Michael Lewis, Lowell Bergman, Maya Angelou, Amy Tan, Daniel Handler etc. Football players Charles Woodson, Rod Woodson, Fred Biletniko, Marshawn Lynch, ice skaters Kristi Yamaguchi and Rudy Galindo, cyclist Andrew Talansky, baseball player Vida Blue, swimmer Natalie Coughlin etc. George Lucas, Francis Ford Coppola, John Lassater etc. Wayne Thiebaud, Richard Diebenkorn, Richard Serra etc. Each guide to moving must include the way how you plan to relocate to another city or state. However, when it comes to San Francisco, there are several best ways to do that. The fastest but also the most expensive means that the best transportation is a plane. It can land in the international airport located in the city. But such a way of relocation can be completed only from certain destinations. Another popular way to get to San Francisco is highways. The city is connected with the continent with a bridge that can be used by all types of vehicles. Consequently, it is possible to arrive in this city by bus if you take only one bag with or by car. At the same time, moving on your own always brings challenges since the lack of relocation experience leads to poor mistakes that could be prevented. That is the reason why it is more reasonable to get professional moving help if you plan to change your current place of living. It is an excellent way to make the process organized, scheduled, and secure. California Movers is a trusted local and long distance moving company that will help every person to feel at home in San Francisco thanks to being surrounded by all the valuables and things he or she got used to. You can order A to Z relocation or choose only services that are the most significant to you. Our movers perform commercial and residential moving services at the highest level, so call us now to book a suitable date in advance. Whether you relocate to San Francisco or think about moving from SF to LA, New York, Seattle or any other city, it is very important to remember several simple tips connected with moving to or from this Bay Area city. Check the weather forecast to be not blown away by wind or get your belongings wet under the shower. Reserve a parking place in advance to have access to the truck. Choose the time of your moving to avoid heavy traffic and standing in the traffic jams. The worst hours are between 6 a.m. and 9 a.m. and 3 p.m. and 7 p.m., Monday through Friday. Be ready to carry cash because credit cards are accepted not everywhere. Register your vehicle and change a driver’s license if you move from another state to vote. Take a snack with because it is impossible to eat out after 10 p.m.
Look through the route and try to remember it well not to become a victim of fog. Make up a route choosing steep hills for a loaded truck to arrive safely to your new home. Ask your friends and relatives for moving help or turn to the professional moving company like California Movers!